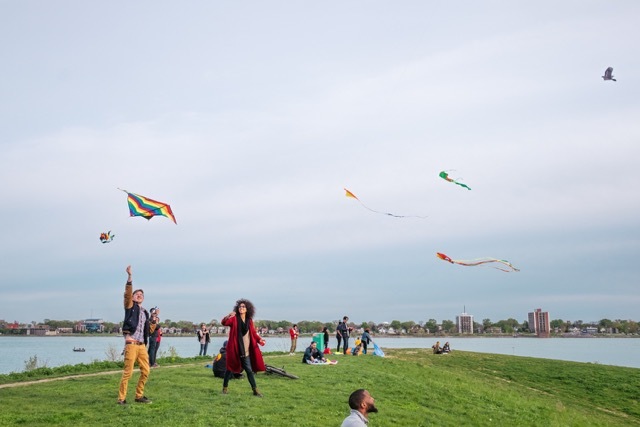 On Sunday, July 16, people of all ages will converge on Belle Isle for Detroit's first-in-a-long-time mass kite flying congregation. The Detroit Kite Festival represents the convergence of engineering, design, global culture, and community, all bound together by the intangible magic of kites. The event is free to the public and is specifically targeted to youth, families, elders, millennials, east siders, west siders and outsiders—in other words, it is for everyone. The Detroit Kite Festival (DKF) is the creation of a group of creatively ambitious designers and community organizers. Director Margo Dalal once attend a kite festival as a child in Washington D.C. and the experience made an indelible impression on her. When she conceived the idea of organizing a kite festival, she hadn't flown a kite since she was seven years old, but thought it would be a simple way to bring people together. Along with a team comprised of Matt Tait, Zoe Minikes, Katie Hearn, and Arthur Bledsoe, the idea has grown from a pitch at Detroit SOUP to a full-fledged nonprofit with funding from a Patronicity crowdfunding campaign, Michigan Economic Development Corporation, and Fresh Era Detroit. The festival itself is the most visible expression of the work that has gone into this project, but the goals of the organization has gone far beyond "party planning." DKF has hosted six community kite-building workshops at community centers, schools, the DIA, and Allied Media Conference, as well as pop-up kite flying events on the riverfront and Belle Isle to get the word out and convert passers-by kite enthusiasts. Part of the vision of DKF is to use introduce kite-making as a platform to connect technology, art, history and culture. A large portion of the events at the festival will focus on free kite-making for people of all ages. Through engineering, research, and trial-and-error, the DKF team has developed effective, low-cost kite designs that range from foldable paper designs for young children, to a tyvek sled kite for older children, and a trefoil model for whomever is game to try. The Detroit Institute of Arts will host a tent at the festival for kite making and decorating. The most ambitious kite-building project is a modular kite based on a design by Alexander Graham Bell in the days before aeronautical flight. Each unit is shaped like a small pyramid with dowel rods for supports and a tyvek covering. DKF has invited participants to design and color their own individual pods, which can be interconnected to create a massive collective kite. Not only is the kite scalable (it can and will grow each time new pods are built), but it also gets stronger as it grows—the bigger the kite, the greater its lift. The engineering principals of the cooperative kite uplift the inclusive philosophy that DKF embodies. Attendees will have five different ways to make kites, but there will also be kites for sale (from $5 to $35) or to borrow. There will be a visual feast of kite designs from far-flung countries like India, Japan, and Bali, daredevil kites with multiple strings that turn tricks, eye-popping kites shaped like whales and dragons, a massive "sled kite" that requires six people to fly it, complex modular kites built by dozens of individuals, and more. While Kite flying may be an under-the-radar recreational activity, it has a universal appeal. There is something about a kite that renders articulate people tongue-tied—it's hard to be eloquent about something so elemental. You could say that a kite is a way to vicariously experience freedom from gravity. You could say that it has a way of making adults smile and kids run and elders wax nostalgic. Or, you could say that kites are happy-making ... so please pass the string! The Detroit Kite Festival takes place on Sunday, July 16 from 10 a.m. to 4 p.m. on the Cricket Field on Belle Isle. It is free and open to the public. For more information, visit the event's Facebook page.